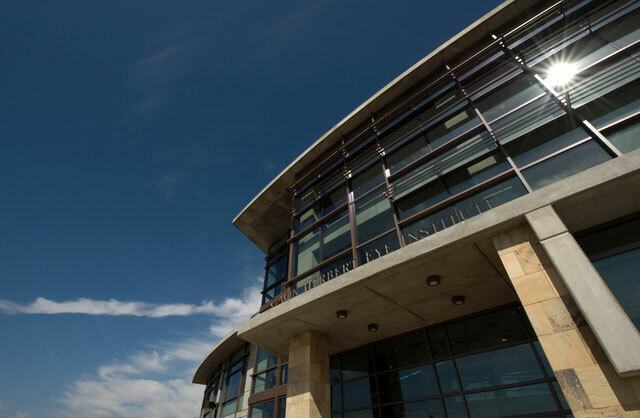 The $39 million, 70,000-square-foot facility housing UCI’s Gavin Herbert Eye Institute opened in September 2013. Part of UC Irvine Health, it boasts 34 patient exam rooms, an optical shop, faculty offices and conference space. The building is the first on campus to require no government funding. Gavin Herbert, founder and chairman emeritus of Allergan; his wife, Ninetta; and his mother, Josephine Herbert Gleis, provided the initial naming gift in 2007. Other major donors included Abbott Medical Optics, the Alcon Foundation, the Allergan Foundation, Julia and George Argyros, the Arnold & Mabel Beckman Foundation, Bausch & Lomb, Esther and James Cavanaugh, the Discovery Eye Foundation, the Kratz Foundation, Marsha and Bill Link, and Kelly and Jim Mazzo. Read more here.